At the end of The Flash‘s second season, Barry Allen decided to travel back in time to save his mother from being murdered by the Reverse-Flash. The ramifications of that decision are currently unknown, but fans know that when the Scarlet Speedster did that in the comic books, he ended up basically breaking time itself. When Barry awoke in the present, he was without his powers in a world he didn’t recognize, which had been ravaged by a war between Aquaman and Wonder Woman. This was an event known as Flashpoint, which ultimately led to “The New 52” reboot, and with the season three premiere of The Flash also titled “Flashpoint,” speculation is currently running rampant. 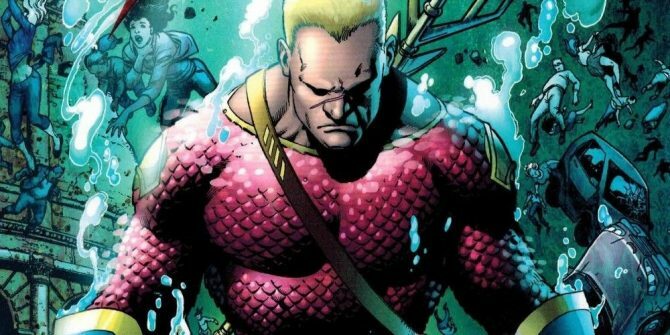 Now, a new rumour appears to add further fuel to the theory that the season will kick off in a new timeline as Twitter user @AquamanShrine claims that we’ll be getting a “glimpse” of Aquaman when the show returns. This could mean anything from a cameo to a blurry image on a computer screen, but we know Atlantis exists on Earth-2, so the stage has already been set for him to appear. It’s probably too soon to start getting excited about the Fastest Man Alive meeting Aquaman, but there’s no denying that it’s a pretty cool thought. With any luck, more details on what we should expect from The Flash season three will be revealed at the San Diego Comic-Con this weekend.